You may still own “old” HiFi equipment from the 1970s or 1980s. There was a lot of great audio equipment manufactured in this era as it was the “golden age” of HiFi. Unfortunately, a lot of this equipment is now stored in the basement as new streaming services take over and many people aren’t using their old CDs anymore. We think it’s a shame to leave this legacy equipment behind. We’ll show you 4 ways how to give your Vintage HiFi a new life. If you’re still using your audio system including an amplifier and loudspeakers, the easiest way to add “digital” to it is to build your own streaming audio player using a Raspberry Pi and the DAC+ and connect it to an input on your existing amplifier. Have a look at the back of your amplifier. Usually you will find unused inputs that can be used to connect additional music source. They might have names like “CD”, “TAPE”, “AUX”. Note that you can’t use inputs name “PHONO” as these these usually include a special phone pre-amplifier that is designed to work only with turntable systems. Also make sure that it is on input – some connectors might be outputs (e.g. “TAPE OUT”). Your old amplifier or receiver might be very bulky. It might not look good any more. You might hear scratching noises when you change the volume, or it might just not be sounding “quite right” anymore. If your only music source is digital, you might replace it completely. To do this, you would build your streaming audio player based on the HiFiBerry Amp. This allows you to directly power your speakers, bypassing your electronics. 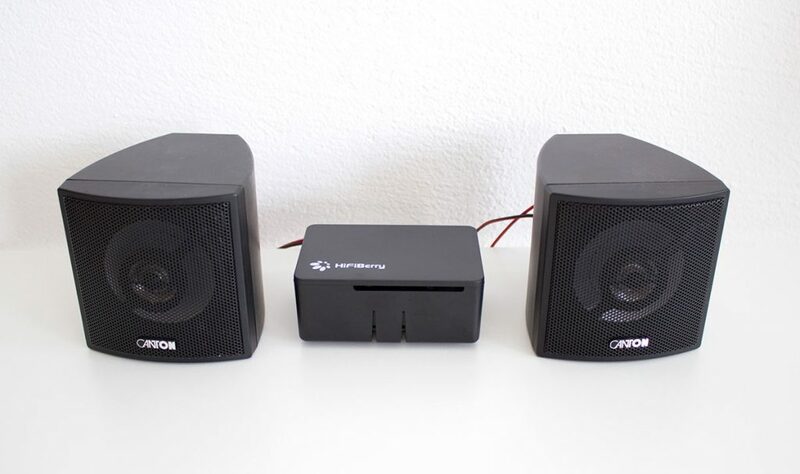 The speakers on this picture are quite small, but the Amp2 is powerful enough for almost any full-range speaker. But don’t throw your old amplifier away yet! Some of these might still be worth a bit. If you paid a huge sum for it 30 years ago, there is a good chance that you can still get some money for it. Some brands are very popular with collectors and in some rare cases, you might get more money for your used equipment than you paid 30 years ago! Even if you won’t get a lot of money for it, check out platforms like Craigslist or Ebay. There will be people with defective amplifiers that will be happy to get a cheap replacement, or hobbyists with advanced skills who can rebuild the equipment at the cost of a few parts and some of their time. Replace the existing amplifier by a Beocreate 4 channel amplifier and use this as a “normal” stereo amplifier. This seems a bit useless – doesn’t it? However, if you’re ready to experiment with it, you will be able to implement all kinds of interesting stuff. You could mix different sources (SPDIF in, Raspberry Pi), implement equalization or even do high-end optimizations like room correction using FIR filters. Note that these will usually require you to design your own DSP program. While it isn’t extremely complicated it might not be for everyone. To get an impression, we recommend that you install SigmaStudio and open our example project. You want to go wild? Check out this project! We’re planning to provide more step-by-step guide for specific use cases in the future. Replace the amplifier and crossover by the 4 channel amplifier. This will give you the most advanced features. Passive crossovers in loudspeakers are usually relatively simple. They work quite well, but with a modern DSP, there is much more room to fine-tune the frequency response of the speaker to help make sure every chassis of a multi-channel speaker works under optimal conditions. We provide pre-configured sound profiles for some classic Bang & Olufsen loudspeakers. Speakers like the CX50 and CX100 have not been manufactured for a very long time, but you won’t find their excellent build quality and components in any speaker under the $1000 range today (we’re talking about a massive aluminum chassis here!). However, if you understand how loudspeaker crossovers work and how to optimize them, you can do it for any other speaker by yourself. You will need measurement equipment for this to make sure to get the best performance out of it.